This system is designed to improve clinical workflow, and perform advanced appointment scheduling. This application shows how clinics and patient are connected online through web based application. In today’s life no one has time to visit clinic and wait for appointment. This application will help for getting online appointment. Patient can get appointment through SMS or Internet. Receptionist will manage all the appointment. Doctor can make his schedule according to patient’s appointment. Patient can see online how many people are waiting for appointment. Doctor will upload all the patient medical history on website. This information is visible to only that patient and to the visiting Doctors. Thus privacy is maintained. As patient and clinic are connected online if patient goes from one clinic to another clinic, visited clinics doctor can see medical history of that patient and personal information of patient. It is waiting room solution. All this services provided to users at free of cost. Keywords: - Alert Notification, Appointment scheduling, Database management, Online Appointment, Report Generation, Secure private information, Unique ID. Proposed system is based on MVC (Model View Controller) architecture which describes our system, in that Mysql server database is acting as model, HTML GUI is view and JSP is acting as controller which controls communication between view and model. 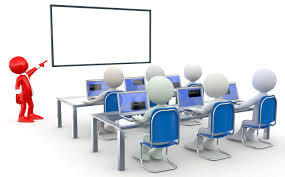 Users are connected to the Web Server through an Internet connection and communication with the database server through JDBC is established and data are accessed directly from the database Server. System’s GUI elements ensure a very friendly User Interface. On the server side there is Mysql server 5.5 acting as the database server and Apache tomcat 7.0 acting as a Web server. The above figure explains working of proposed system. Doctor, Patient, Receptionist and Medical Representative are client side users. All these users are connected to proposed system through internet. System is managed by Admin at server side. Proposed system’s users are described below. Patient can search doctor by doctor’s degree or specification, doctor’s name or clinic’s name. If particular doctor have an emergency, then appointments are taken after that, and then rescheduling of appointments is done by the receptionist. This message is display on website, receptionist will report this message. Patient can utilize his/her time rather than going at early in the morning to take appointment and wait till the number came. Secret information of patient is not visible to other patient; privacy of the patient is maintained. Time of the hospital and day when hospital is close is displayed. Emergency contact number of doctor will be displayed. Doctor can see the personal information and allergic information of patient, and depending upon the allergy, doctor can give him prescription. Doctor can also view the patient history. There is no need of paper to keep record of patient. All patient data is stored in the proposed system. It is easy for doctor to keep record of all patients, and also to retrieve the patient information. Receptionist will help to manage appointment scheduling. Receptionist will inform whether doctor is available or not. Receptionist will send alert notification from his/her clinic to the patient. e.g. tomorrow clinic will be closed. Main revenue of proposed system is from Medical Representative. Medical Representative will advertise his medicine on website, and it is visible only for doctors. Medical Representative can insert record of new medicine and remove records of banned medicine. Admin will manage all database of proposed system. Admin will update system time to time. And all these updates are available to user without any additional cost. All new patients firstly need to do registration. If they have already registered then they can directly do the login. After login patient will search for the doctor depending upon doctor’s name, specialization or location, if the required doctor is selected, then patient needs to select the date for appointment. If any time slot is available then confirmation message is send along with time. After receiving confirmation message, if time is not convenient for patient then the patient is given different time slots to select from and whichever is convenient is selected by the patient. After the procedure is completed the patient logs out. At the end of day all the clinics can generate report showing number of patient visited to the clinic. System can also able to generate report for number of patient suffering from particular disease for that clinic. All the clinics in city are connected so that we can get report for number of people suffering from particular disease from particular city. This report will be useful for government for making survey for diseases. Patient will get appointment confirmation SMS on his mobile regarding time of visiting to the doctor. Patient will also receive health care tips regarding common diseases e.g.swine flu and dengue. Alert notification also takes care of user’s privacy as we are sending notifications according to their request and settings. This module is used to authenticate and authorize the user. This module includes registration and validation on username and password to access the system. This module is used to manage and maintain the users. Administrator is given privilege to maintain patient and doctor record. Patient and doctor can also update their personal information and password through the system. This module is to handle appointments for patients. Patient can select the available time slot of particular doctor to make an appointment. The system will automatically check the patient’s status according to appointment. If slot is available, the appointment will be confirmed immediately. Besides that, the system does a complete check to avoid appointment conflict. Once appointments are full, the system will change the consultation status to “full”. Patients can view their current appointments and appointments history. The Admin also can view their appointments list. Since all the appointments are stored in the database, the users are able to trace back whenever they need to. There are also appointment search functions to allow the user to locate appointment quickly. In addition, the user can easily print the report. Prescription will sent directly on patient’s mobile via SMS. This will save written work of doctor as well as paper. Digital signature will verify prescription. As most of the mobile uses Android operating system, android application of unite clinic will be available. In today’s world, use of cloud computing is increasing at rapid rate, so in upcoming future we will host our system in cloud computing. Pharmacist will view prescription given by doctor to patient. Pharmacist will enter patients ID and then he will able to view the prescription for patient. We are making survey of treatments given by doctors, from which we are creating reports. That reports will be available to other Doctors for reference. 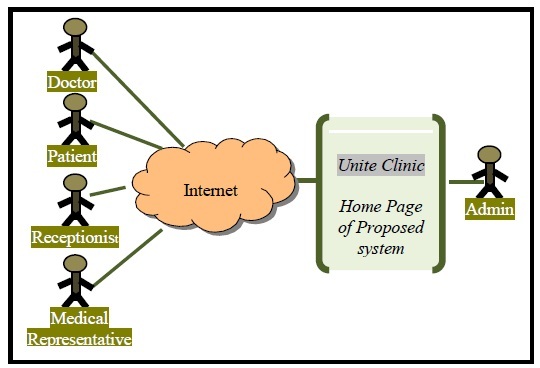 The Proposed system is used to connect all clinics in a city. System is available to doctor, patient and receptionist at free of cost. 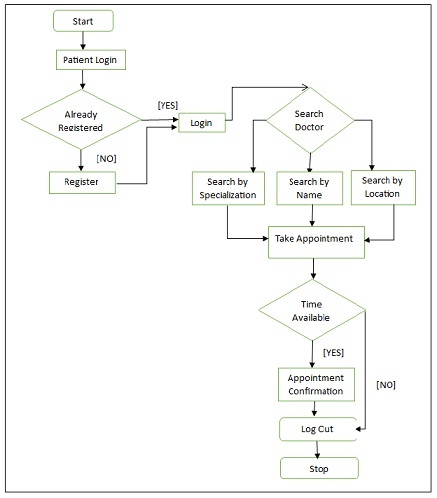 System assigns unique ID to each doctor and patient. System manages all records. Also ensures security, integrity, privacy and availability of information. Appointment Management scheduling software allows patients to manage scheduling appointments. Bo Hang, “Web based long-distance appointment registered system,” CCTAE, 2010 International Conference, vol. 3, Page(s): 232 – 235. Lu, K.M. ; Hamid, S.H.A., “Conceptual Design of Web-Based Appointment Management System using Object WebML,” ISITAE '07, Page(s): 354 – 359. Marinos, S.; Nikolopoulos, P.; Pavlopoulos, S., “A WEB-based patient record and appointment management system,” BMES/EMBS Conference, 1999, Vol. 2. Wijewickrama, A. “Simulation analysis of appointment scheduling in an outpatient department of internal medicine,” Simulation Conference, Dec. 2005.